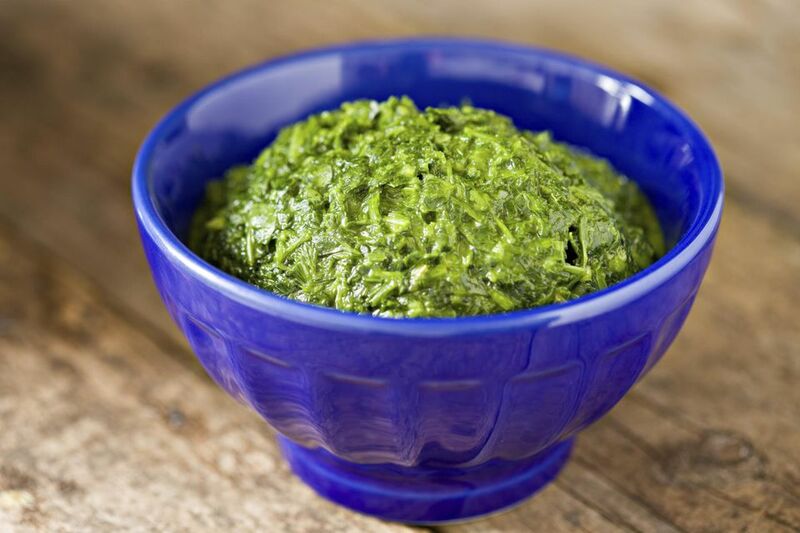 Chimichurri is an Argentine sauce typically used with red meat, but it is also excellent with fish and seafood. The traditional recipe always has parsley, garlic, and oregano, but you can mix it up from time to time depending on what herbs you have. Mint and borage (which tastes like cucumbers) are excellent substitutes with seafood. Heat the water and dissolve the salt in it. Remove from heat. When water is cool enough to stick your finger in, proceed with the chimichurri. Put everything except the olive oil into a food processor and pulse to combine. You can puree it or leave it chunky, as you prefer. With the motor running, drizzle in the olive oil and buzz for 30 seconds to a minute. Allow it to marinate for a few hours before serving. Chimichurri should hold up for a week or two in the fridge.